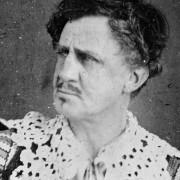 Junius Brutus Booth (1796 – 1852) was an English stage actor, considered by many to be the foremost tragedian of the mid 19th century. He moved to the United States in 1821, and was he an eccentric! Read about his life if you have time. 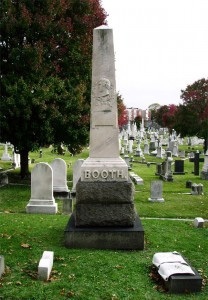 Like his son Edwin, who was famous in his own right after him, Junius Brutus Booth is remembered as the father of John Wilkes Booth, the assassin of Abraham Lincoln. He is buried in Green Mount Cemetery in Baltimore, MD. Trivia: He once wrote and mailed a letter threatening to kill Andrew Jackson, who at the time was President of the United States.